This entry was posted in Campus Announcement, General News and tagged Auburn Oaks, growth rings, Toomer's Corner on May 21, 2013 by Wire Eagle. AUBURN UNIVERSITY – Growth rings from the base of Auburn University’s College Street live oak at Toomer’s Corner have revealed the tree’s age of 83-85 years old at the time they were removed April 23. This week, two Auburn professors independently counted 81 growth rings in two directions from the center of the tree’s trunk. 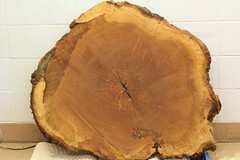 Keever worked with Brian Via, an associate professor in Auburn’s School of Forestry and Wildlife Sciences, to age the tree by counting the growth rings. 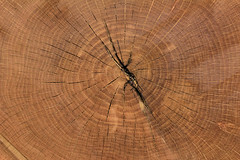 The rings are alternating bands of early and late wood and typically constitute the growth in trunk diameter that occurs in one year. The findings support the previously reported planting of the two oak trees in 1937—one along College Street, the other along Magnolia Avenue. Photographs taken in 1938 and 1939 show two trees that were eight to 12 feet tall. “Field-grown live oaks of that size would typically be eight to 10 years old,” Keever said. “The photographic evidence coupled with our growth ring count makes us confident in aging them at 83-85 years,” said Via. Auburn University is currently looking at ways to publicly display the wood from the oaks, including the cross-section from the base of the College Street tree. “We have sanded and oiled this particular piece and it’s simply magnificent,” said Keever. Items made from the Auburn Oaks’ wood are being sold by several manufacturers that have been licensed by the university. Photographs and descriptions of the items can be found at www.auburn.edu/oaks. Royalties earned from their sale will fund scholarships for Auburn students.